Food-borne illness outbreaks are big news on prime-time TV, and odds are that you’ve had a case of food poisoning yourself. 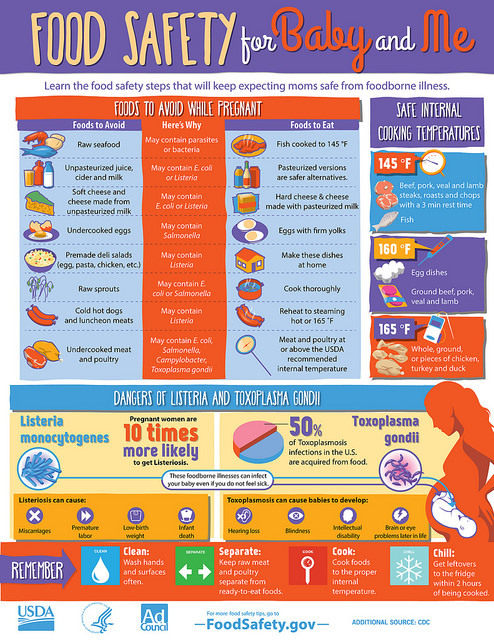 During pregnancy, you’re more susceptible to food-borne illness—and it can hurt your baby too. But, with some food safety knowledge and safer food handling, you can keep yourself and your baby healthy. Food poisoning refers to more than just eating “bad” food. Most food-borne illness is spread through poor hand hygiene, keeping food at room temperature too long or not cooking it to a hot-enough temperature. Many illnesses are passed from hand-to-hand contact (especially in crowded places like cruise ships) and hand-to-food contact. For example, bacteria can be spread from infected food-handlers or workers who don’t wash their hands properly. Water you come in contact with while swimming could put you at risk for illness if the water has a high level of bacteria. Also, some illness is spread through contaminated water that you might come into contact with. For example, at your local swimming pool, lake, the beach or through contaminated drinking water. No surprise: produce or seafood that comes into contact with water containing sewage can also cause serious illness. However, this is more of a problem in under- or undeveloped countries. Kick these bad bugs to the curb with food safety tips! 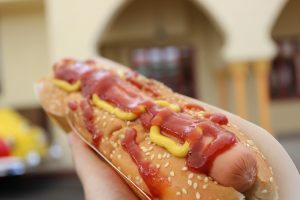 Do not eat hot dogs, luncheon meats, cold cuts, other deli meats (e.g., bologna), or fermented or dry sausages unless they are heated to an internal temperature of 165°F / 75°C or until steaming-hot just before serving. Do not eat refrigerated meat or vegetable pâté or meat spreads from a deli or meat counter or from the refrigerated section of a store, unless heated to steaming. Foods that do not need refrigeration, like canned or shelf-stable pâté and meat spreads, are safe to eat. Refrigerate after opening. Don’t eat raw (unpasteurized) milk and foods that are made with it. Soft cheeses made from unpasteurized milk, regardless of whether it’s made from cow, goat or sheep milk, are more likely to harbor Listeria. Only eat cheese with PASTEURIZED MILK in the ingredient list. Read why it’s important to avoid raw milk here. 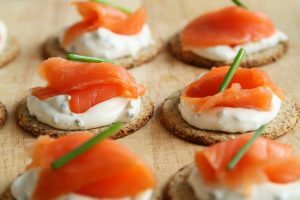 Smoked salmon like this is a no-no during pregnancy unless heated to steaming! Do not eat refrigerated smoked seafood, unless it is contained in a cooked dish, such as a casserole, or unless it is a canned or shelf-stable product. Refrigerated smoked seafood, such as salmon, trout, whitefish, cod, tuna, and mackerel, is most often labeled as “nova-style,” “lox,” “kippered,” “smoked,” or “jerky.” These fish are typically found in the refrigerator section or sold at seafood and deli counters of grocery stores and delicatessens and should be avoided, unless heated to steaming. Canned and shelf-stable packets of tuna, salmon, and other fish products are safe to eat. There have been big food-borne illness outbreaks linked to melon. Wash well! Wash hands before and after handling whole melons like cantaloupe. Scrub the surface of melons with a produce brush under running water. Sanitize brush after use. 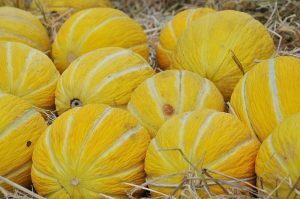 Refrigerate melon that is not eaten right away; keep it no more than 7 days. Canadian women get similar eating advice regarding how to best avoid Listeria. Advice from other countries is slightly different: In Australia, pregnant women are advised to avoid soft white cheeses, like brie and feta, pâté, oysters, pre-packed salads and soft serve ice cream.. In the UK, women are told to avoid mold-ripened soft cheeses such as brie, camembert, chèvre (goats’ cheese) and others with a similar rind; soft blue-veined cheeses, such as Danish blue, gorgonzola and Roquefort, unless heated to steaming, and all types of pâté, including vegetable pâté.. In France, the advice is similar, with the addition of avoiding rillettes, foie gras, the crust of cheese, unpasteurized cheese, tarama (a fish roe salad) and raw germinated seeds. Toxoplasma gondii is a parasite carried by cats and can also contaminate food. Toxoplasmosis may cause mild flu-like symptoms in pregnant women, but if the parasite is passed on to a fetus, it can cause preterm birth and stillbirth and can be the cause of learning, visual and hearing disabilities later in childhood. Toxoplasmosis can result from eating undercooked meat and poultry or unwashed fruits and vegetables, from cleaning a cat litter box, or from handling contaminated soil. Make sure to wear gloves when gardening and emptying cat boxes. Wash fruits and vegetables well, and cook meat and poultry thoroughly. 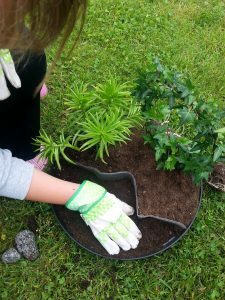 Wear gloves when gardening, handling soil, sand or cat litter. If you have a sand box for children to play in, keep it covered to keep cats out. Wash your hands after handling animals, especially cats. For more information on Toxoplasmosis, see the March of Dimes. More pregnancy food safety advice at FoodSafety.gov. Special eating tips for the holidays from the CDC. « Pesticides: A Risk Factor for ADHD? Great post! Every momma should know :). Love this infographic! Great job there Bridget! Thank you for posting this! It’s super helpful! Love that info graphic! Such important information, thanks for sharing!